Lea este caso de estudio en español. Changing the way a campaign is planned and developed can be difficult for any civil society organisation. Long established processes are reinforced when organisations – and the people in them – are busy experts naturally averse to reviewing (or changing) the accepted way of working. That’s especially true if results have been pretty good for a while. Nevertheless, taking the time to experiment with new approaches can produce even better outcomes. That was the case for Greenpeace Mexico. It was the first organisation anywhere to use the MobLab’s Campaign Accelerator – and its Food and Agriculture Campaign was one of the first campaigns to use the process. The resulting campaign forced Bimbo, one of the largest food manufacturing companies in the country, to change its practices. The Accelerator allows organisations to explore tools and techniques for building strong team collaboration while crafting strategic campaigns with public engagement in mind. The Accelerator’s four-phase design process (define, sense, create and prototype) develops strategy and tactics to engage with those needed for campaign success. Several sections of Greenpeace Mexico, including the agriculture and food program, participated in Campaign Accelerators in 2016. Team members worked to build and refine on the campaign against Bimbo with the help of Tracy Frauzel, then Mobilisation Strategy Director at MobLab. The initial aim was to target Bimbo, a Mexican multinational grocery chain and baking company. Greenpeace hoped to see Bimbo abandon high-impact farming practices such as the excessive use of pesticides and fertilizers. This followed release of a Greenpeace report detailing the negative effects Bimbo’s crop management practices had on local flora and fauna. The company had a good reputation which posed a challenge to campaigners. Bimbo has a long history in the country and a network that reaches almost all Mexican consumers with over 20 brands. A successful campaign needed to reach a large audience including people unfamiliar with or traditionally unsupportive of Greenpeace. The chance to change Bimbo’s practices was a huge opportunity that demanded a new approach to audience engagement. 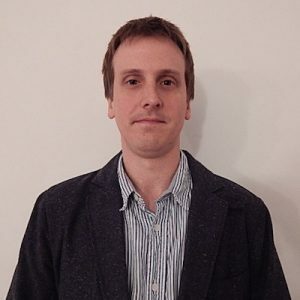 Instead of developing a campaign over months in different, somewhat isolated departments, and launching it as they would normally do, the Campaign Accelerator allowed the team to explore ideas and try them out in advance through a learning process. It was also a much wider team effort. Staff worked as a group that didn’t rely solely on each other’s traditional roles. “We wanted to run more integrated and creative campaigns to reach larger audiences, but we were limited by self-imposed myths. Working against Bimbo was a big challenge, as it is a company cared for by consumers. So, we had to try new ways of campaigning,” said Aleira Lara, agriculture and food Program leader at Greenpeace Mexico. The team began by learning. They looked at different audiences to understand the best ways to develop a successful campaign targeting Bimbo. They also looked at who could be engaged by such a campaign as well as and who had powerful voices needed to move the company. For example, the team discovered they had to focus on Bimbo’s consumers, which were students, kids and young mothers under 35 years old. Working with Frauzel, team members developed campaign ideas and took them to the streets to test them out by talking to people there. They took public feedback to the office to share with others. The team then chose the ideas that performed best and developed campaign prototypes around those ideas and feedback from the people they met. “I liked the possibility of trying out ideas and seeing if they work or not until we reach the best outcome. It wasn’t easy as it wasn’t something we were used to doing. But then we realized that by taking the idea to the street and trying them out we would then get a much better result,” said Miguel Farfan, Greenpeace Mexico’s fundraising director and an Accelerator participant. After selecting a few ideas and developing the prototypes, the team was ready to implement the campaigns targeting Bimbo. Despite testing ideas in advance through a prototyping process, the team know that not every idea would make it to launch intact. However, the team was ready to iterate and adapt because of the alignment and trust built working together on collaborative campaign design. “All the team members agreed on the ideas with the highest potential and now it was time to take them into action. We were changing the way Greenpeace was used to working. Everybody was excited to see the outcome,” said Frauzel. 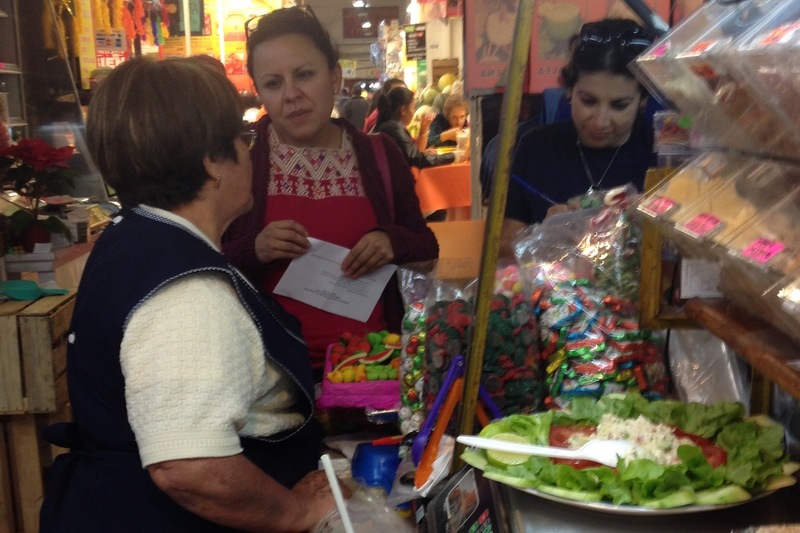 Greenpeace Mexico’s Aleira Lara talks with a market vendor about campaign ideas during Campaign Accelerator. The team initially proposed a junk-food vending machine. A video playing on the machine would give information about the food selected, including not so mouth-watering data about excessive use in agrochemicals and pesticides in the food’s production. Simultaneously, a second vending machine with organic products would be developed to show food can be produced in a different way. Unfortunately, the vending machines couldn’t be implemented because of budget limitations. It was also harder than expected to develop video messages that effectively conveyed negative and positive health impacts. The Campaign Accelerator process also helped the team discover that associating Bimbo’s production process with harm being done to bees could be an effective campaign message. Several social media actions were set up involving people sharing bee symbols in their networks. Another successful intervention organized races in several Mexican and American cities. The races were linked to bees and the harm done to them by Bimbo’s heavy use of pesticides. Adults and kids dressed up as bees while running the race. Bimbo relies on children in its marketing campaigns so it is sensitive to criticism coming from kids and their parents. Meanwhile, the team sought to intensify the campaign at key moments. For example, Greenpeace members interrupted a Bimbo shareholders meeting and asked people to call the company’s headquarters to put pressure on them. The call to action collapsed Bimbo’s phone lines. An online petition was set up asking Bimbo to commit to a plan to switch to agroecological production. Over 160,000 people signed the petition. 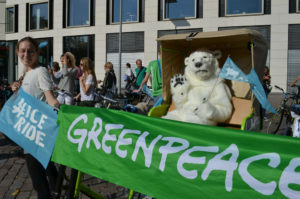 The team followed with actions including people holding banners and signs at Bimbo’s offices in Mexico, where Greenpeace members asked people to pressure the company through social media. After ups and downs, the team’s efforts ended with success. Bimbo signed a commitment to abandon high-impact agricultural practices such as excessive pesticide use. Bimbo also agreed to pilot purchasing only sustainably grown corn. The commitment was in line with the set of principles Greenpeace Mexico presented to companies to promote sustainable agriculture. These include local production with smallholder farmers, no use of pesticides and agrochemicals, respecting the human rights of farmers and communities, and protecting biodiversity. The Campaign Accelerator increased transparency in the campaign planning process. It also increased participation in strategy development that led to a stronger, more aligned team better able to iterate and find alternatives when presented with setbacks. At the same time, it proved that testing and quick feedback loops can give staff the confidence needed to think bigger, take risks and pursue bold ideas. Now, more than a year after going through the Accelerator, many staff at Greenpeace Mexico have incorporated its concepts and changed the way they work. Nevertheless, they acknowledge there are still challenges ahead.